If you are searching for Custom Range Hoods, or Custom Range Hoods Near Me, in Arizona, California, New Mexico, Colorado, Oregon, Washington State, or Utah, Artistic Alloys & Design, Inc can help! 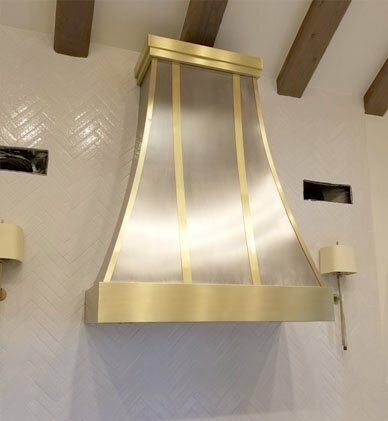 We fabricate custom range hood covers, decorative metal range hoods, and designer range hoods out of any metal including brass, iron, stainless steel, copper, tin, zinc and more. 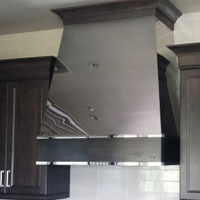 We can create nearly any type of kitchen exhaust hood you can think of! 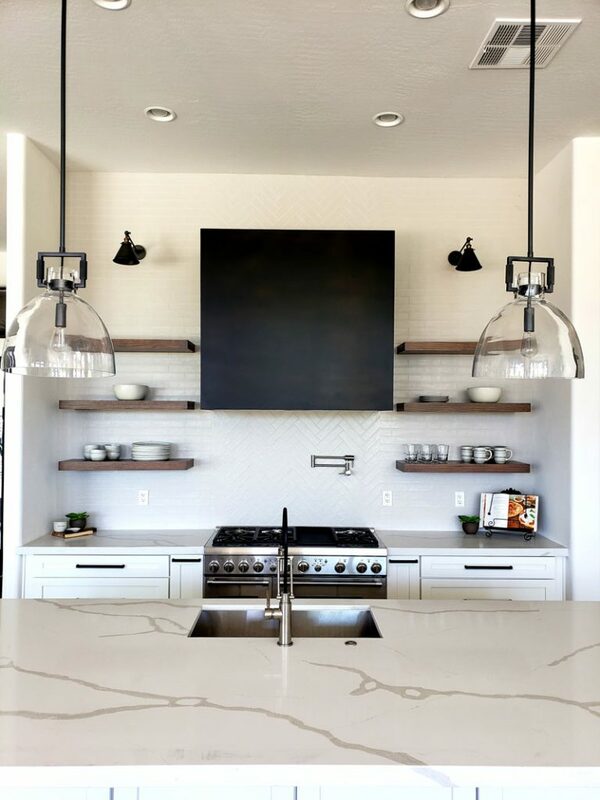 If you would like to receive a free range hood estimate in Arizona or anywhere else, give Artistic Alloys & Design, LLC a call today at (480) 941-2611. We sell, fabricate, and ship Wall Mount Range Hoods, Ducted Range Hoods, Ductless Range Hoods, Under Cabinet Range Hoods, Island Range Hoods and more, to all areas of the United States. We also offer luxury kitchen hoods. 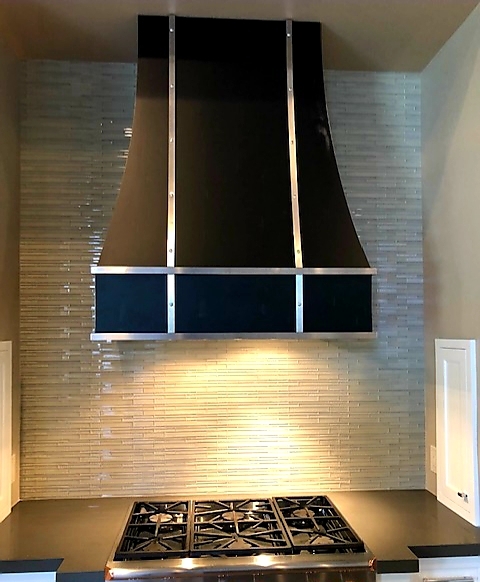 If you could use a custom range hood to get more enjoyment out of cooking in your kitchen, give our expert hood fabricators and installers a call today at (480) 941-2611. We ship nationwide! 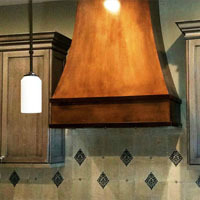 We can come out and consult with you to make your custom range hood dream a reality. If your home or project is outside Arizona please contact us with your measurements and design inspiration. We’ll get to work on a design and send it with a quote for your approval. Once approved we will fabricate your range hood, carefully package it, and ship it to you. 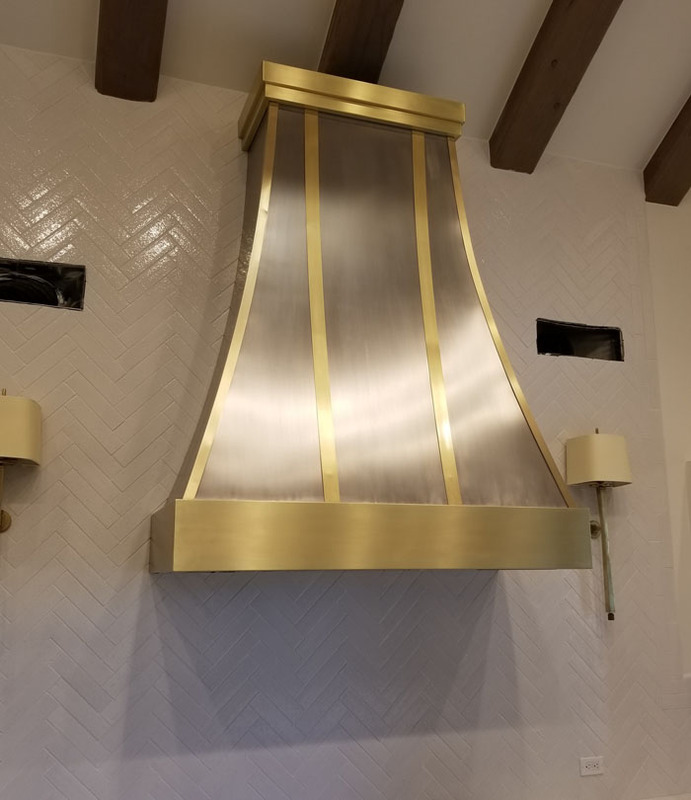 We fabricate custom metal range hoods with almost any metal including: wrought iron, copper, zinc, and any other alloy you’d love to see in your kitchen we will design, fabricate and install your custom range hood in your home. Give us a call today to get your custom metal range hood and start enjoying cooking and your home more! Cooking is more fun and more social when the range is in the center of the kitchen, installed in the island. While this is a great feature of top end kitchen designs it means having proper ventilation installed over the island. This is what island range hoods are designed to do. When the range is in the center of the kitchen it makes it possible for more people to cook at once. It also makes it more social to cook as whoever is using the range is looking out to the rest of the kitchen, not facing a wall. With a set of bar stools, family and friends can chat while the meal is being prepared. Most kitchens feature wall mount range hoods. These range hoods are mounted on the wall and exhaust fumes from cooking quickly and effectively. That means the cook stays more comfortable while preparing meals along with the air quality in the whole home staying better. Air quality in the home is important not only for the health of the occupants but the condition of the property. Excessive moisture in the home from not exhausting the steam from cooking leads to mildew or worse, mold. Use a quality range hood in your kitchen to preserve your health. Ducted range hoods or ducted oven hoods are pretty common. However, some kitchen designs limit where your hood can be installed due to the way these hoods move hot air out of your kitchen. A ducted hood must be connected to a duct or vent with pipes that carry airborne particles to the outdoors. This is what differentiates a ducted ranged hood from a ductless range hood, which recirculates air through a filter then right back into the kitchen. You will need the proper ducts if you choose a ducted range hood. Ductless range hoods can be installed nearly anywhere in your kitchen. They do not need to vent to the outside and you do not need a duct to install. Ductless range hood work by sucking in air, filtering it and blowing it back out into the kitchen. Ductless oven hoods use a recirculation process to filter the air. The air filter contains charcoal and activated carbon which helps remove smoke particles and odor from the air. Then it can recirculate clean air back into the kitchen. You are required to change out. 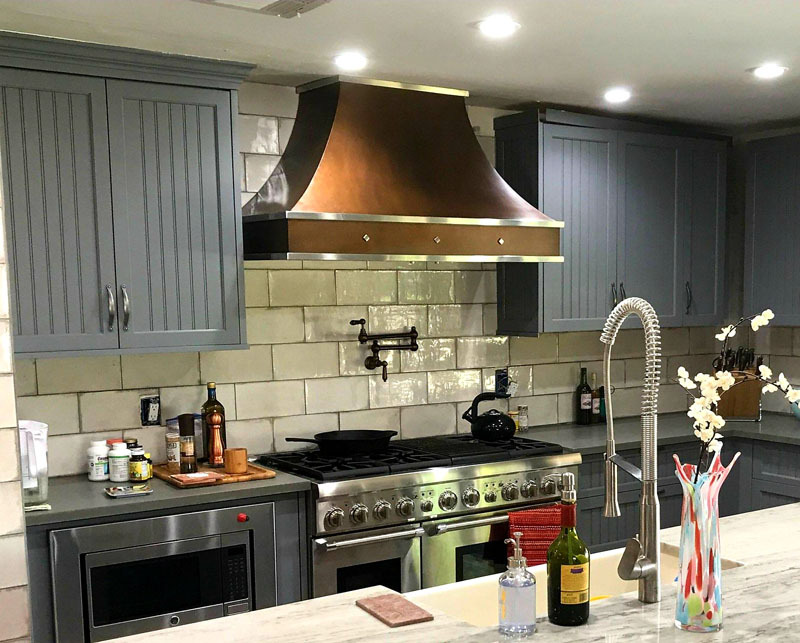 When buying a home or remodeling a kitchen in Scottsdale, Paradise Valley or anywhere else in Arizona, custom built metal range hoods can really set off the design of a kitchen. They can be as beautiful as they are functional. Cooking causes steam and a little smoke. Effectively exhausting the smoke and steam helps ensure that you have good air quality in you home. It’s frequently overlooked as an opportunity to really set your home apart and keep the air quality healthy. 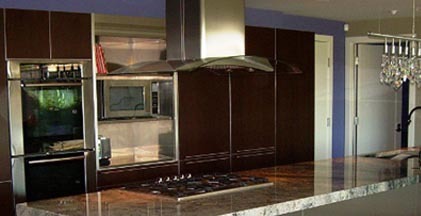 When looking for custom range hoods in Scottsdale, look no further than Artistic Alloys & Design, LLC. If you have a house in California and want to install a new range hood we supply the most custom and highest quality in the industry. You can choose the style, type of metal, size, and more when you order from the completely custom range hood fabricators. Our range hoods are just as functional as they are visually stunning for any property. You can send us your inspiration for a design or you can tell us the style you’re interested in and we can settle on a design. We fabricate all of our range hoods to last and ship them anywhere in California including Los Angeles to give you the very best range hoods. What Is A Oven Hood? Many homes in the Arizona and California area have oven hoods. In order to understand why they are important, it helps to understand what they are and what they do. A range hood’s purpose is to extract the heat, airborne grease, odors, smoke and fumes from cooking and exhaust them outside. Some range hoods also have filtration if the air must be returned to the living space. 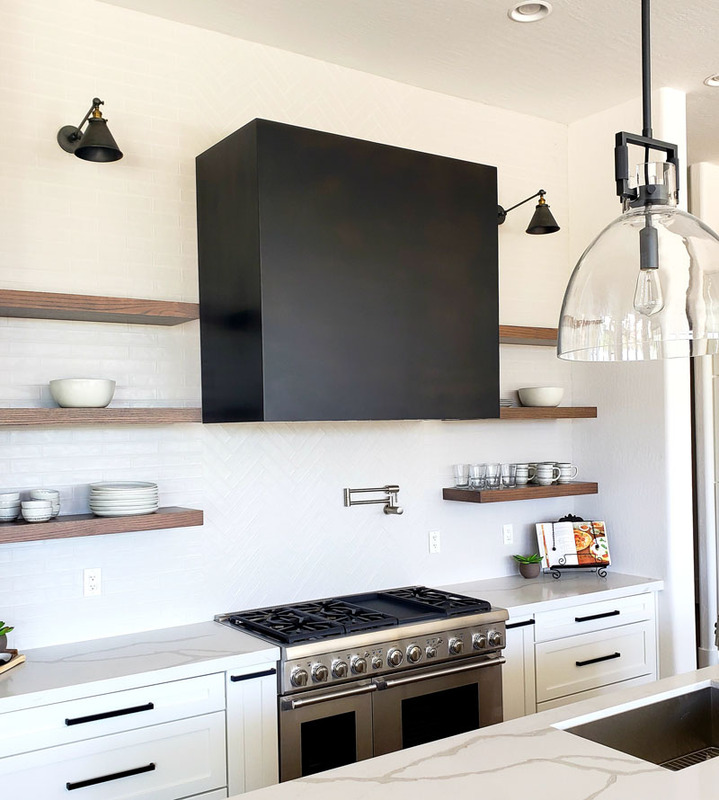 There are quite a few benefits of having a range hood in your Scottsdale kitchen, whether it be your home or professional kitchen. Let’s take a look at some of the advantages of having a range hood. We all pay enough for electricity as it is keeping our homes cool. 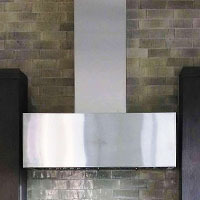 One of the main jobs of the range hood is to try to capture and control the heat from cooking. The heat and steam rising from cooking just rises and circulates through you kitchen and home without a range hood being installed. Not only will your house stay cooler while cooking if your range hood is turned on but you will stay more comfortable cooking. With the air being sucked directly up less of the steam and heat is able to get to the master chef that’s preparing that wonderful Scottsdale meal. This means you will enjoy cooking more and be able to just focus on the recipe, ingredients and getting it right. It might not be a portable air conditioner, but it will help you breathe easier and stay cooler while cooking. All cooking releases some steam, some types of cooking release smoke and fumes. As good as some of these smells might be, they are not good for our lungs. There are even some cooking fumes that are potentially toxic. For the cook having to be close to these smells while making sure that the steak is medium rare, and not charcoal can expose them to these harmful fumes. 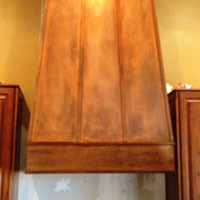 A custom range hood in Scottsdale can help remove these toxins before they are a problem. As soon as you hit the power switch the range hood kicks on and takes the harmful particles out of your kitchen. This will help keep you and your family healthy. It also helps avoid unnecessary moisture from being in your home. If the steam and greasy air is allowed to linger it can cause mold, and even germs and bacteria. One of the main dangers from cooking without a range hood is carbon monoxide. We all know how bad it can be for us and how hard we work to avoid having it in our homes. A range hood helps exhaust the carbon monoxide that cooking creates outside and away from our homes. Without a range hood, cooking is just about the last thing many of us want to do at the end of a hard day’s work. In Arizona, most of us have a hot commute home and hot outdoor chores around the house. No one wants to then jump in front of a range without adequate ventilation. Make cooking enjoyable again with a range hood. We all have those recipes we are especially proud of, or that favorite meal. Don’t let a discomfort of cooking stop you from enjoying the finer things in life. 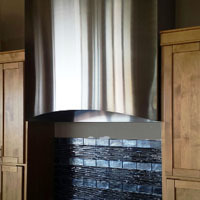 Get a custom range hood in you Scottsdale home and start cooking. It will mean you have more control over what ingredients end up in your food. This means you can choose the vegetables and meat that you know are fresh. That leads to a healthier and happier family and house. We already know that having a custom metal range hood helps keep the air cleaner. 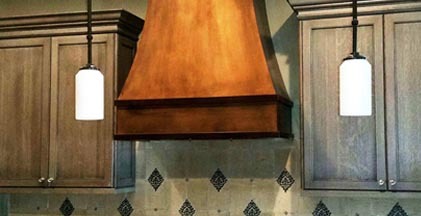 In addition, having a custom range hood means increasing your property value. Custom range hoods can be designed to be the right size for your kitchen. This means that it will effectively remove the cooking fumes from your living space. 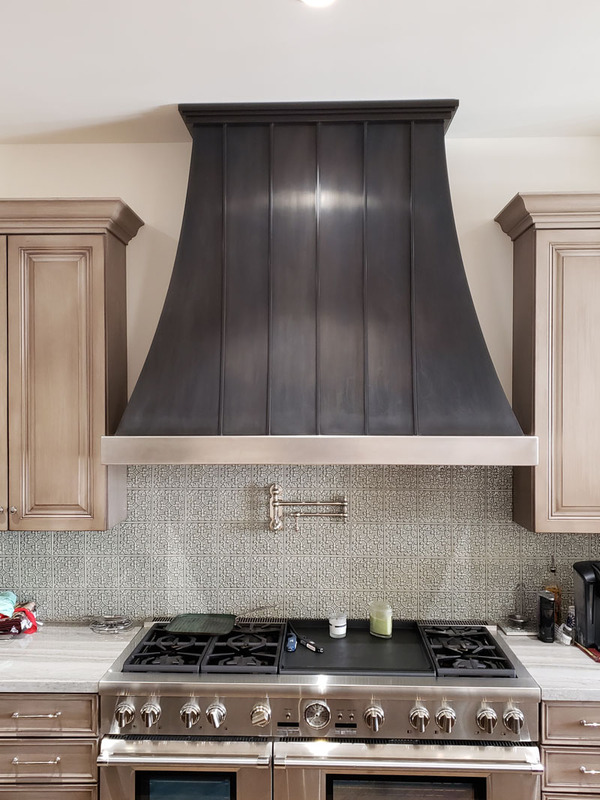 Not only will it do a better job cleaning the air, but when you get a custom range hood you will be able to use metals and styles that match your kitchen design. This will provide you a seamless design for your range hood that compliments your kitchen’s style. You get to enjoy cleaner air and a beautiful centerpiece for your kitchen’s design. And when or if you are ready to sell your home and move to an new house it will increase your resale value. In fact, realtors will tell you that many Scottsdale residents have come to expect this luxury. 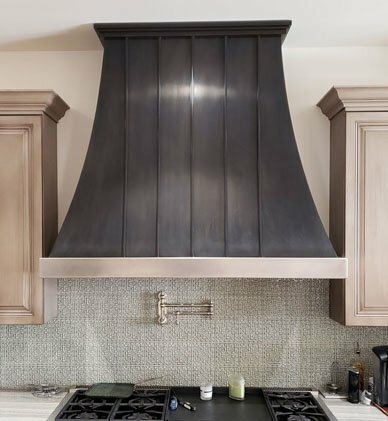 If you’re home doesn’t have one it will hurt the resale value of the house as prospective buyers will factor in installing a custom range hood. Most lighting directly over you range is centered in the kitchen. When you get up to the range and start to cook you end up casting a shadow where you are trying to work. Custom range hoods are equipped with lights that make cooking safer and easier. Having that adequate lighting is critical for proper measuring of spices and other cooking ingredients. Also when you are cooking meats having good lighting can help you tell when your meat is done. Not only does it help when are actually cooking, but it helps in clean up. With better lighting you will be able to see the spots that might need a little more TLC. Grease and splatter from your pans can be hard to see if you don’t have enough light. Not removing all that grease can lead to excess build up that can be dangerous. We fabricate completely custom range hoods for our clients, ship them nationwide, and install them anywhere in the Phoenix Valley. If you would like to receive a free range hood quote in Arizona, Washington State, Oregon, California, New Mexico, Colorado, Utah, or another part of the country; please give Artistic Alloys & Design, LLC a call today at (480) 941-2611. If you are searching for Custom Range Hoods, or Custom Range Hoods Near Me, in Arizona, California, New Mexico, Colorado, Oregon, Washington State, or Utah, Artistic Alloys & Design, Inc can help!